There are many uses for school mascot graphics, and the truly prepared squad will have a large collection of them on hand for whenever they are needed. There are several different formats that graphics come in today - a veritable alphabet soup of jpg, png, gif, pict, bmp, or whatever other computer format is the new thing. However, by just following a few simple rules, you can make sure your school mascot graphics look good everywhere. To decide the right resolution you need to think about where you are going to use this graphic? Are you making a banner for a pep rally? Spirit signs for the team? 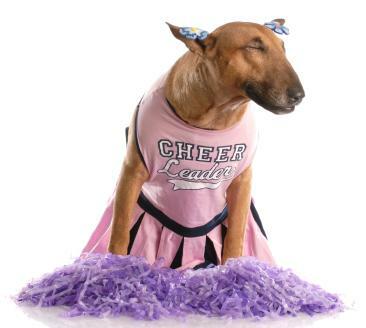 Or is this a graphic for the school website reminding everyone about cheerleader tryouts? You may be tempted to just copy an image of your mascot off the internet and have a local copy shop print it off on a huge banner. If you do, it's likely you'll end up with a blurred, blocky version of your school symbol. The resolution of an image is based on how many dots there are in every inch of image - also known as dots per inch or dpi. Most images on a computer screen will have 72dpi - and they'll look fine. However, if you put that same image on something with a bigger area there's still only the 72 dots, and that's going to make the image look bad. As a rule of thumb, make sure the image is at least 150dpi if you're going to print it on something like a flyer or poster - and that's for lettering and cartoons. If you're going to want to use a color image, you want 300dpi or more. When in doubt, get the higher resolution - you can always make it less, but you can't make it more. Most schools have paid money to have their school mascot's graphics created for the team jerseys, for the school letterhead, etc. But these are the things that the students see every day - to really get people excited, try taking that mascot idea and finding something new to do with it. One of the easiest ways to do that is to simply get a new version of the same idea. You could go to google, type in the name of your mascot, and then just click on the "images" button to find a new graphic. However, that would be stealing - most images are copyrighted, and therefore should only be used with the express permission of the artist. Luckily there are many sources online for quality original graphics at a low price - or even free. iStockPhoto is a vast online warehouse of images for as low as $1 created by designers and photographers the world over. The image illustrating this article (and many others from LoveToKnow) come from this source, and it's a great place to go for inspiration. Creative Commons is a different kind of source. It is actually a concept, allowing artists to control where and how their art is displayed and what they get for it. Some artists don't want money, they just want acknowledgement - other artists don't even need that. The website has links to photo sites like Flickr as well. Your Own School - Most schools have talented artists who can be persuaded to create images and graphics based on the school mascot - in fact, many of them probably have pages of doodles already. Getting them to contribute to your squad's resources by creating and scanning in graphics can be a great way to really solidify the school spirit. Finally, think about how you're going to use the graphic. Is this a poster for a big game? If so, you probably want to keep things on a serious note. Is it a banner designed to be used in the middle of the football field? Make sure it's big enough by actually taking it out there before the game. Are these signs to help the crowd during floor cheers? Make sure they are really clear and that you have them in the right order. Most cheerleaders have experience enough to know how to best use a graphic, but make sure you check with each other to avoid embarrassing mistakes. Follow those three tips, and your graphics will shine. Use them to send a message of inspiration to the team, the fans, and the students alike.